sunshine on a sunday.....just what i need - BODIE 3.7 . you'll never walk alone ! Thank you for the sun on a sunday. Thankyou and enjoy the rest of your day. oooh this our spring time but it is hot hot hot ....and if your winter feels like the uk then you have every right to be a little excited *g*, find memories. I agree! (And preferably without the humidity.) Thank you! I think Bodie wins the trouser-cut competition, in the next one, but Doyle definitely wins the soppy expression competition in the third. And who couldn't love Happy Lads in the forth ! 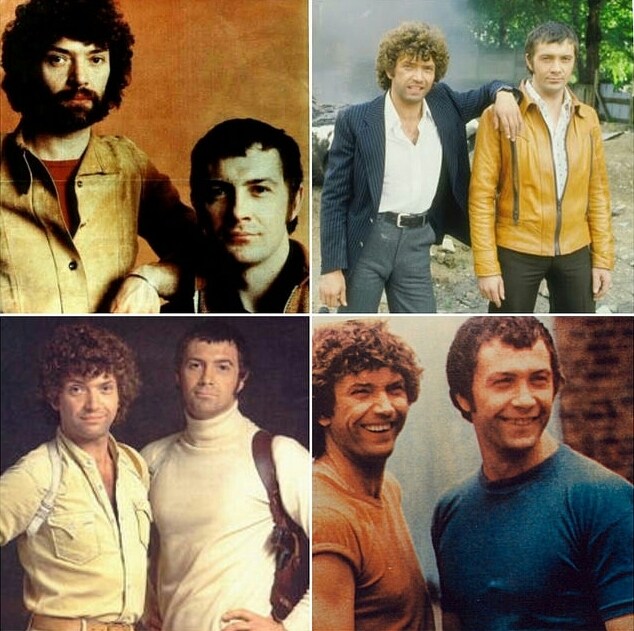 cheers, going from L-R with you, gorgeous looking Bodie and Doyle leaning heavily on him (and why not that's what i say) and sporting a beard too. yes Bodie's trousers are well admired by myself ...and lots to admire too. Yes happy lads all smiley and friendly. Glad that you enjoyed them and thankyou. oh yes indeed, some beautiful lad images to go with such a beautiful sunny day. I've always liked young Martin with a beard, but never seen a bearded Martin in a photo with Lew! Thanks for that! Glad you like them all and please enjoy, thankyou. Never far apart, and that's how is should be. The lads together are sunshine for any day, thanks for sharing. yes they do look good together and even more so when they are stuck together. You are most welcome and thankyou for looking. it doesn't matter what day of the week it is, the lads together are always lovely to look at especially when they are touching and yes they are always a welcome ray of sunshine. Glad that you enjoyed looking at them, thankyou.